By the time the monsters reveal themselves in the new horror thriller Us, viewers already have a good idea who they are. We’ve spent the first 20 minutes of the film getting to know Adelaide and Gabe Wilson (Lupita Nyong’o and Winston Duke) and their children, Zora and Jason (Shahadi Wright Joseph and Evan Alex)—a middle-class family vacationing at a beach house in Santa Cruz. We see ourselves in the way they drive a station wagon with a stick figure family decal on the back window. We see ourselves in Zora and Jason’s sibling bickering, in Gabe’s goofy dad jokes, in Adelaide’s maternal peacekeeping. We know the Wilsons because the Wilsons are us. As the movie’s title suggests, we Americans are both the monsters and the victims in Us. The plot, involving an uprising of doppelgängers, makes no literal sense but carries a powerful metaphor. Us’ monsters look and act like us, but they live in the shadows. As Red explains, where Adelaide enjoyed sunshine, warm meals and gifts, she and the other doubles lived neglected in underground tunnels. Their suffering, the movie suggests, made the Wilsons’ all-American life possible, and the Wilsons didn’t even know about it. Us presents a terrifying vision of America and its sins, revealing the complicity we all share in an economy that benefits some and leaves others hungry and destitute. 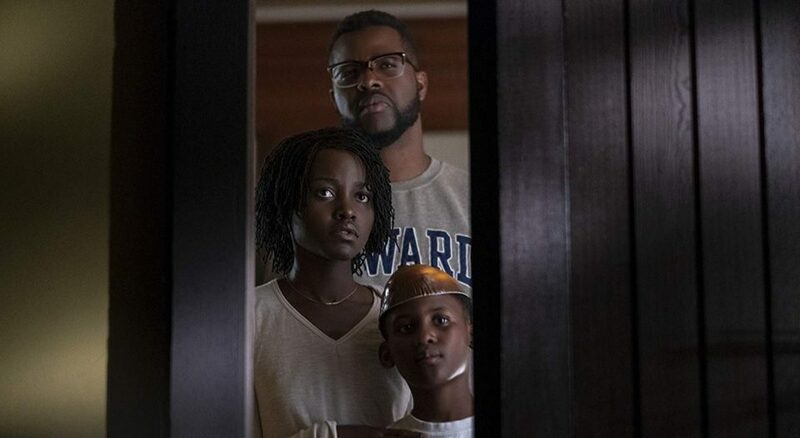 With Us, writer-director Jordan Peele presents a terrifying vision of America and its sins, revealing the complicity we all share in an economy that benefits some and leaves others hungry and destitute. Like most Americans, the Wilsons aren’t trying to harm anybody—they’re just trying to live the American dream, refusing to acknowledge that it creates a nightmare for others. For both Jeremiah and his audience, this was a horror story, as terrifying as anything we see on a movie screen. And it’s not the only one in the Bible: Isaiah tells about leviathans, Ezekiel about walking corpses, and Daniel about beast-like chimeras, to name a few. Even Jesus talks about “the desolating sacrilege.” All are meant to get us to recognize the terror inherent in turning away from God. Our sins are great, and God always finds ways to show us their consequences. But because of God’s great love, we are not consumed, and no sin can wipe away the grace already extended to us. When we see our sins displayed on screen in Us, we should be scared. But that fear can also show us the depth of God’s grace, the forgiveness that enables us to turn back to God and care for the dejected and powerless. Joe George's writing has appeared at Think Christian, Tor.com, and is collected at joewriteswords.com. He hosts the web series Renewed Mind Movie Talk and tweets nonsense from @jageorgeii.